Your RV is a big investment. Don't scrimp when it comes to protecting it. Our covers are high-quality, durable, American-made products backed with a 5-year fabric warranty. This cover is designed to fit Class B RVs. It is available in various widths, and can accomodate heights of up to 88" tall and widths of up to 76" wide up front, 58" wide in the middle and 76" wide at the back. The front and rear of the cover has elastic in the hem for a snug fit. Four thirty-three foot adjustable tie-down straps are included. These straps wrap over and under the unit and snap shut with a quick-release buckle. A Reinforcement Kit is included. Use this kit to reinforce areas where excessive wear might occur. Polyguard is an American made marine-grade polyester. While extremely water repellent, this fabric breaths, keeping moisture from being trapped underneath it. Polyguard is UV and mildew resistant, and resists fading as well. 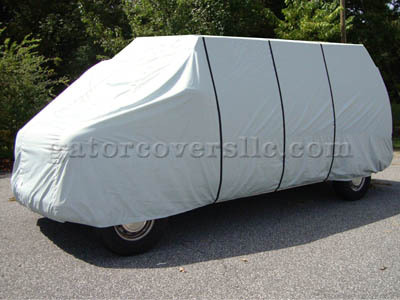 Before ordering, please review our information on how to measure for an RV cover. Questions? Call Gator Covers at 239-652-0916.